So far, Bone Tomahawk is one of the best films of 2015. Films like it are only enforcing my strong belief that we�re living in the golden age of neo-western film. Furthermore, it seems that the standards set by films like The Salvation, The Retrieval, and the Das finstere Tal are constantly upgraded by other filmmakers who dare to push the genre into its next developmental chapter. 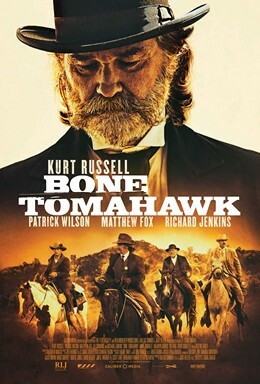 Here�s one way to describe it: Bone Tomahawk is a film that somehow managed to get connected with the spirit of Quentin Tarantino circa 1991 and offer him a chance to use a cast of choice to make a western horror dead-pan delivery dark comedy. The man that got the opportunity to channel this spirit is S. Craig Zahler, who made his debut with this film. Before this, Zahler worked as both writer and cinematographer. But, in this film, his directorial results can only be described as flawless. Using a simple story, set at the end of the 19th century, which follows a group of men going after a tribe of cannibalistic Native Americans with the purpose of retrieving a woman, the director made a killer film. There�s no better way to describe this movie than to call it sharp. All in the world Zahler made can cut right to the bone. This includes the bone tomahawks shaped from the jaws of horses that the cannibals use, but also the way characters perceive the world and their roles in it, and even goes all the way to the language they use. To say that the film is witty would be a gross simplification of the completely unburdened nature of the script. Similar to other neo-western stories, it is liberated from the nonsense of contemporary films that might be called horrors. Here, the terror is fused with humor and the completely foreign way in which the people of that (relatively recent) time understood and approached their environment. At one moment, a member of the party, without any hesitation, kills two strangers who they notice in the dark approaching their campsite, even though they agreed to disarm themselves a moment before. His rationalization is simple: the two were robbers or a scouting party for other robbers. No one else would approach a campsite without making their presence known and there is no room for special circumstances. While there is some protest, all appreciate his logic and just pack up and leave. In other words, the Wild West was as different to the modern mentality as much as the middle Ages were. This film doesn�t make a big deal out of it, just recognizes it as a stone cold fact. The second thing that makes Bone Tomahawk into such a masterpiece is its humor and the way it bursts out of the characters, who all act brilliantly and I don�t want to commend anyone in particular (OK, maybe Richard Jenkins). In some ways, the humor is integral to the idea of violence and suffering � from the modern perspective, the things that the main characters do are irresponsible, cruel and wildly risky, but to them, they are just the way the world works. In the West, dying violently was kind of expected and you were expected to roll with the punches until you end up in a ditch surrounded by a beautiful sunset in the prairie. The genius of S. Craig Zahler lies in the fact that he managed to present this type of grim and pointless historical idea in a wildly fun, funny and gory film.